Are First Amendment rights in danger? Ten years after the Supreme Court gave school administrators broad powers to censor student journalists, high school papers are still publishing unflinching stories about AIDS, drug abuse and other teen problems. But would-be journalists face an uncertain future. College journalism programs turn out far more graduates than the nation's newsrooms can hire. Public trust in the news media is at a shockingly low level, and for those who labor within the industry, long hours and low pay are the usual rewards. Moreover, campus protests of editorial content have become commmonplace. On the plus side, the rise of the Internet offers new job possibilities, and career prospects for minority journalists are better than ever. 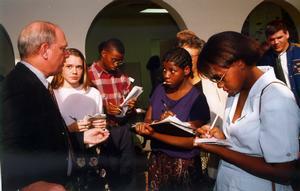 And while high school journalism has nearly disappeared from America's inner-city schools, it thrives elsewhere.